GRAND RAPIDS, Mich. – SpartanNash is asking its store guests, associates and communities from across the U.S. to submit digital designs that represent local state pride in Nebraska, North Dakota and Michigan. Winning designs will be featured on its limited-edition reusable bags. The contest is part of SpartanNash’s companywide Earth Week activities, which will emphasize SpartanNash’s commitments to corporate responsibility and environmental sustainability. The company encourages customers to use reusable bags to help decrease the consumption of single-use bags. To enter the reusable bag design contest, participants can submit artwork that shows their state pride and what it means to be local for any of the three states. The goal of the reusable bag design contest is to showcase state pride and celebrate the talented artists that are part of the communities SpartanNash serves. Designs must be submitted to corporate.responsibility@spartannash.com by 5 p.m. ET on March 1, 2017. Michigan (D&W Fresh Market, Family Fare Supermarkets, Forest Hills Foods, ValuLand and VG’s). One winning design will be selected from each state, and the winning artists and their artwork will be announced on Earth Day, April 22, 2017. The reusable bags will be available in the following months. 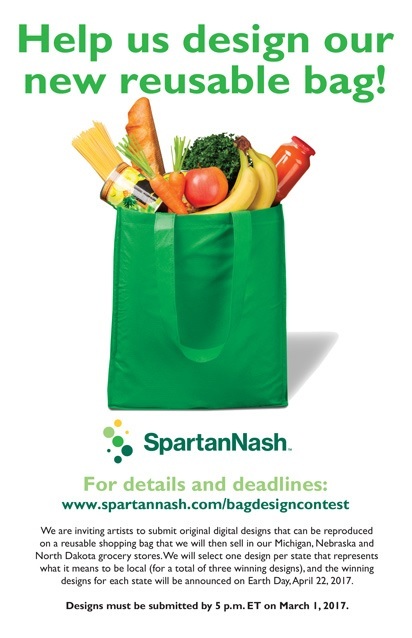 Please visit SpartanNash.com/bagdesigncontest for official rules and entry identification form. For Earth Week in 2016, SpartanNash partnered with 21 Goodwill affiliates in 14 states, collecting 50,261 pounds of donated goods and materials. Additional fun and educational Earth Week activities were held companywide, celebrating the importance of sustainability. Many SpartanNash stores also gave away seeds and reusable bags, collected worn U.S. flags for proper retirement and held Earth Week bakery competitions.